Had to have my car towed this morning. The alternator apparently died last night and my battery got me all the way to Hahnemann Hospital which is literally one block from where I work! The car stalled in the middle of the intersection of Broad and Vine and a cop pushed me in front of the hospital (after he yelled at me to "Move it along!" when I stalled). 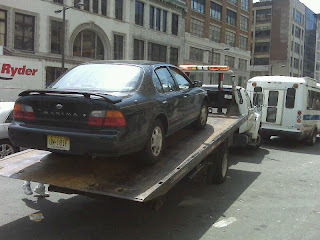 Here's Maxima getting towed away.